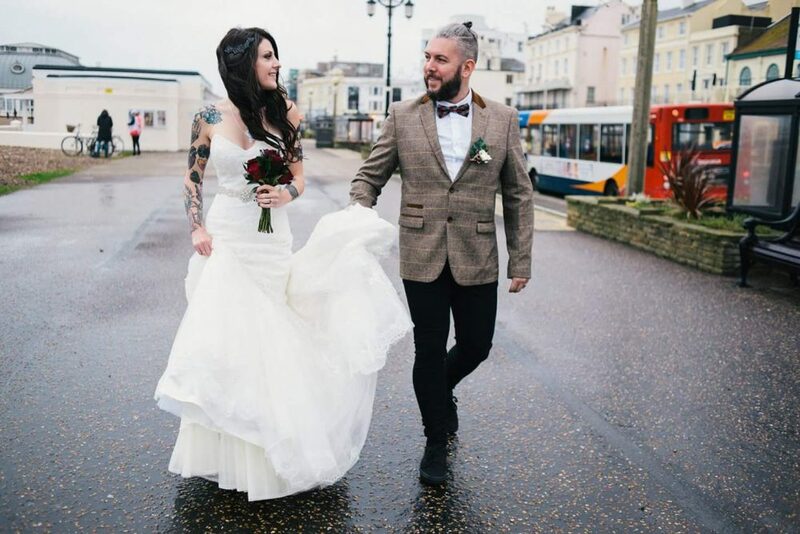 “We married on 29th October 2015 on a mega grey day! Our wedding was super cheap but was all about us. We decorated the venue with Halloween bits and bobs and had the glittery wedding cake of our dreams! My engagement ring was made by BMM and it is perfect. I’m not about loads of sparkles (the wedding cake was an exception!) but I knew I wanted it to stand out. My engagement ring is rose gold with a black diamond and it is my most treasured item. Our wedding rings match, we knew we wanted the stacked rings and something personal added to them. I have a tattoo that says “Til death” and I got it in relation to Tim. He’s my foundation and holds me together at times and those words mean so much. We decided that we’d have “Til death” on our rings and we’re so glad we did. Finding wedding rings can be hell! We are so lucky to have found you guys. To know that our rings are made just for us is brilliant. Wedding rings are personal, it’s not just a gold or silver band, it’s something that holds so much love.